Grey Seals Spared from a Hunt! Hay Island, Nova Scotia, February 2009: The grey seal hunt is canceled this year due to lack of buyers for the seal pelts. I have some wonderful news to report. I have just returned from the shores of Hay Island, Nova Scotia, where the annual hunt for grey seals was scheduled to start. There, instead of bearing witness to sealers beating defenseless seal pups to death with wooden bats, I stood amidst a spectacular nursery, alive with protective, nurturing mothers and their babies. See a video of those lucky seals. The Department of Fisheries and Oceans and the government of Nova Scotia announced last week that they were authorizing another grey seal kill. But yesterday, seal processing plants told seal hunters that they would not buy the skins of the baby grey seals, and the sealers stayed home. We have been working diligently to ban the trade in seal products in Europe, and buyers are now unwilling to purchase grey seal pelts because global markets are evaporating. With the pending ban on seal product trade in the European Union, the writing is on the wall -- this is the beginning of the end of the commercial seal slaughter. 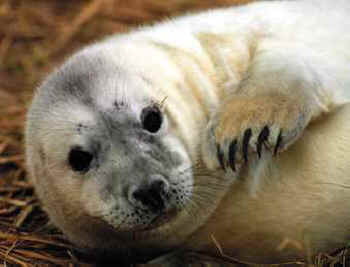 Many sealers are now openly wondering whether shrinking markets will also impact the imminent commercial harp seal kill. In light of these developments, HSI Canada is urging the Canadian government to buy out sealing licenses and develop alternative economies for coastal communities. The grey seal pups are likely safe for now, but in just a few weeks, the true target of the world's largest slaughter of marine mammals -- the harp seals -- will be killed by the hundreds of thousands in horrible ways. Still, just as with the grey seals, there is hope for the harp seals. Not only is the demand for seal products drying up; the boycott of Canadian seafood products is costing the Canadian seafood industry far more than the seal hunt brings in. Thank you for helping us keep up the fight for seals, and for all that you do for animals. Sadly, this is just the beginning of the commercial seal hunting season in Canada. We will be working to protect these magnificent creatures until the commercial hunt is over for good.